What’s the Stem Cells Buzz this Week? - CHD7 in Glioblastoma, Autophagy in Hyperglycemia, MSC Secretome in Corneal Healing, and CS-GAG in Bone Regeneration! Recent research from the lab of Anita B. Hjelmeland (University of Alabama at Birmingham, Birmingham, AL, USA) sought to understand how the ischemic environment promotes the development of glioblastoma (GBM), the most common primary malignant brain tumor in adults. In their STEM CELLS paper, Boyd et al. identify the chromodomain helicase DNA binding protein 7 (CHD7) as a novel ischemia‐regulated gene whose expression decreases in brain tumor-initiating cells and neural stem cells and affects angiogenesis. The authors hope that these findings will have important implications in the study of normal development, stem cells, and cancer. Gestational diabetes can promote the dysfunction of neural stem cells (NSCs) and the onset of fetal neuropathy; however, melatonin treatment may represent a protective therapy. 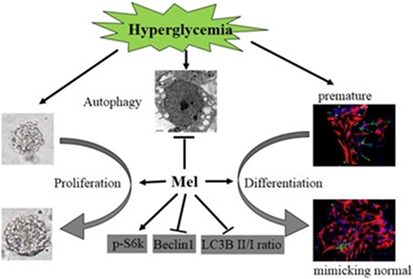 Now, researchers from the laboratory of Shilei Ni (Qilu Hospital of Shandong University, Jinan, Shandong, PR China) report that hyperglycemia inhibits proliferation and induces premature differentiation of NSCs by promoting autophagy and autophagic flux. However, Li et al. also demonstrate that melatonin can counteract this effect and maintain normal proliferation and differentiation in NSCs by modulating autophagy, which protects NSCs mainly by downregulating Beclin‐1 and up modulating mTORC1 signaling. For more on the potential of melatonin as a treatment for gestational diabetes, see STEM CELLS now! Mesenchymal stem cell (MSC) therapy may represent an effective means to treat severe corneal injuries and the associated vision loss, mainly through the secretion of anti-scarring, anti‐inflammatory, and anti-angiogenic factors. 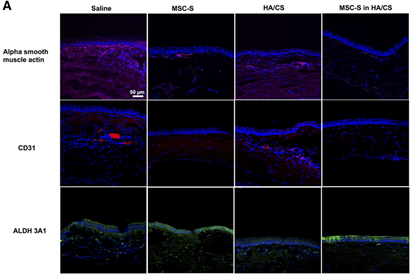 Now, a study out of the labs of David Myung (Stanford University, California) and Ali R. Djalilian (University of Illinois at Chicago, Chicago, Illinois, USA) established that the lyophilized secretome of MSCs reconstituted within a viscoelastic gel of hyaluronic acid and chondroitin sulfate enhances corneal epithelial wound healing in vitro and in vivo. Furthermore, this strategy mitigates the development of stromal scarring and neovascularization after chemical burns in vivo. For more information on this fascinating study, head over to STEM CELLS Translational Medicine. 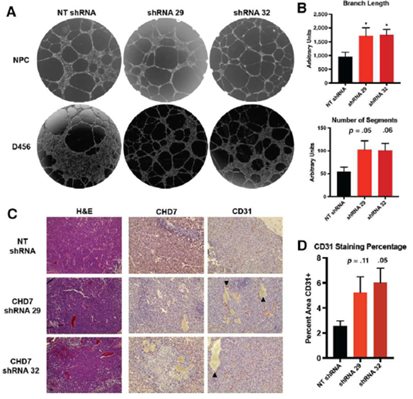 New research from the lab of Steven Stice (University of Georgia, Athens, Georgia, USA) sought to extend the duration of bone morphogenetic protein 2 (BMP‐2) exposure in order to enhance the treatment of large bone defects. In their STEM CELLS Translational Medicine study, Andrews et al. 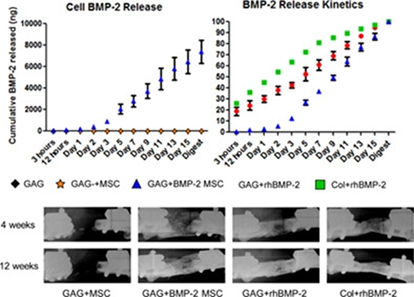 now establish chondroitin sulfate glycosaminoglycan (CS‐GAG) scaffolds as a delivery vehicle for recombinant human BMP‐2 (rhBMP‐2) and rhBMP‐2 expression via human BMP‐2 gene inserted into mesenchymal stem cells (BMP‐2 MSC). Both these strategies induced comparable bone formation, as measured by bone volume, strength, and stiffness, when compared to rhBMP‐2-laden collagen sponge, the current standard treatment.